Summer in Seattle has finally happened. We’ve had sunny days and warm nights and I was able to entertain a wonderful group of women in my backyard last Saturday night. I can’t say enough about how lovely this group was. It was my first time meeting many of them and I couldn’t have asked for more gracious or appreciative guests. They were kind enough to share lots of positives about the food and even better, ate it all up! The best compliment a chef can have is an empty plate! They also took pictures and asked me to share the recipe for the dessert I served, so here it is for all to enjoy. It’s from one of my favorite cookbooks, Suzanne Goin’s Sunday Suppers at Lucques. Cherries are in season now, so it’s a good one to try soon. There is a lot of cooling and waiting involved, so you may want to make this the day before you want to serve it! I made the crust and lined the tart shell the day before and chilled overnight. I made the filling the day before as well. Toast the almonds on a baking sheet about 10 minutes, until they darken slightly and smell nutty. When the nuts have cooled, place them in a food processor with the sugar and pulse to a coarse meal. Add the flour and salt and pulse again to combine. Transfer to a mixing bowl and pour in the melted butter, almond and vanilla extracts and 1 tablespoon ice-cold water. Using a wooden spoon, mix until just combined, adding more ice-cold water if necessary to help bring the dough together. Use your fingers to press the dough into a buttered 9-inch fluted tart pan, pressing the sides first and then the bottom to form an even crust. Chill at least an hour, or preferably overnight. Remove from the oven and cool on a rack. Once it cools, remove the paper and beans. Split the vanilla bean in half lengthwise and using a paring knife, scrape the seeds and pulp into a medium saucepan. Add the vanilla pod, sugar and ¼ cup water. Over medium heat, cook the mixture, without stirring, until it’s caramelized to an amber color. Once it begins to brown, you can swirl the pot a little to get the caramel to color evenly. While the sugar is caramelizing, stir 1 tablespoon water into the cornstarch (this is called a “slurry” and will help thicken the fruit juices). When the sugar is an amber brown, add the cherries and swirl the pan again. Add the grappa, brandy or rum, turn the heat down, and let the cherries simmer a few minutes, until they have softened. (The caramel will seize up and harden at first, but don’t worry, it’ll remelt.) Strain cherries over a bowl, or remove them with a slotted spoon, and return the liquid to the pot and bring it to a boil over medium-high heat. Whisk the cornstarch slurry into the liquid and bring it back to a boil once again, stirring often. Cook a few more minutes, until thickened. Transfer the cherries to the bowl, pour the liquid over them and stir to combine. Let cool completely. Fill the cooled shell with the sweet cherry filling to just below the level of the rim. 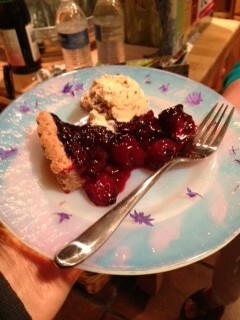 Return the tart to a 350 degree oven and bake 1 hour, until the cherries darken to a deep ruby red. Let the tart cool 15 minutes before cutting. Serve in wedges with scoops of almond ice cream (recipe follows). Toast ovens on a baking sheet for 10-12 minutes until lightly browned and smelling nutty. When they’ve cooled, chop coarsely. Place 1 ½ cups of the chopped almonds in a medium saucepan and pour in the milk and cream. Bring to a boil over medium heat. Turn off the heat, cover, and let the flavors infuse for about 30 minutes. Bring the mixture back to a boil over medium heat, stirring occasionally. Turn off the heat. Whisk the egg yolks with the sugar together in a bowl. Whisk a few tablespoons of the warm cream mixture into the yolks to temper them. Slowly, add another ¼ cup or so of the warm cream, whisking to incorporate. At this point, you can add the rest of the cream mixture in a slow, steady stream whisking constantly. Pour the mixture back into the pot and return to the stove. Add the almond extract and cook the custard over medium heat 6-8 minutes, stirring frequently with a rubber spatula, scraping the bottom and sides of the pan. The custard will thicken and when done will cost the back of the spatula. Strain the mixture and chill at least 2 hours (or overnight) in the refrigerator. Process in an ice cream maker according to manufacturer directions and when it’s done, stir in the remaining almonds.